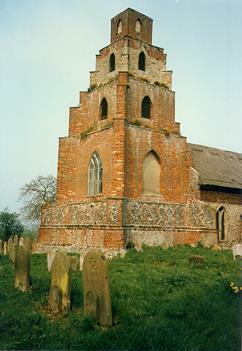 A medieval parish church, dating to the 12th, 13th and 14th centuries, with a unique 18th century tower, buillt on the foundations of a 16th century tower. The 18th century tower rises up in a ziggarut of 'building blocks', and originally had a spire or pinnacle on top. Unique tower, with early 16th century base, with late 18th century 'building block' stages making up the rest of the tower, which originally had a spire or pinnacle. Nave has doors and a window of about 1200; chancel and other nave windows about 1300 to 1320. Nave roof raised in 15th century and brick south porch built. Roman tiles claimed to be in wall, which is doubtful. Two Perpendicular windows, early 16th century? A second church, perhaps called St Peter's stood close to the site of St Mary's. Visited E. Rose (NAU) 19 March 1987. 1990. Survey of window of south porch. A. Cattermole (NLA), 27 June 2005. --- Newspaper Article: Eastern Daily Press. 1990. Fresh thatch for old church. 19 October. --- Aerial Photograph: TM 4993A-F.
--- Newspaper Article: Eastern Daily Press. 1975. Cathedral timbers used in tower repair. 25 November. 2. --- Newspaper Article: Eastern Daily Press. 1975. Cathedral oak for Burgh St. Peter tower. 9 May. --- Oblique Aerial Photograph: Edwards, D.A. (NLA). 1996. NHER TM 4993N - S (NLA 367/HXS12) 02-JUN-1996. --- Photograph: Ashley, S.. St Mary's, Burgh St Peter. --- Newspaper Article: Eastern Daily Press. 1996. Blaze destroys roof of church. 28 October. --- Newspaper Article: Eastern Daily Press. 1997. Bishop backs plea by fire-hit church. 26 June. --- Newspaper Article: Eastern Daily Press. 1998. Woodworm delays repairs to church. 24 January. --- Archive: Clarke, R. R. and NCM Staff. 1933-1973. Norwich Castle Museum Record Card - Roman. Burgh ST Peter. --- Newspaper Article: Eastern Daily Press. 1996. Overcoats on at blaze-hit church. 14 December. <S1> Unpublished document: Rose, E.. 1987. Building Report..
<S3> Unpublished document: Ashley, S.. 1991. NAU Report No. 6. Survey of Window, South Porch, Church of St Mary, Burgh St Peter..